So back in the summer of 2014 I got on this Tangerine Dream kick. I mean, I’d owned a couple records of theirs since back in 2009, but I wasn’t really a fan until this past summer. My local record shop had pulled in this huge haul of used vinyl and amongst the giant catch were a few Tangerine Dream records. Two really caught my eye: Phaedra and Rubycon. I knew they were both very pivotol albums in their discography so I immediately snagged them up and took them home. To my ears, Phaedra was the culmination of years of experimental space noise and desolate aural landscapes for Edgar Froese and Tangerine Dream. It was dark, ominous, and just four tracks. Zeit seemed to be the ultimate space freakout record, and Phaedra upped the ante by honing their musical visions. After Phaedra, Rubycon wasn’t as ominous but more ambitious. Just two songs. Two musical suites. Each side felt like a dream explained in wisps and whooshes. Froese really seemed to be painting a picture with synthesizers and it was rather magnificent. If there was a sound that would proceed what we know as classical music in some lunar colony future it was definitely what Tangerine Dream created from 1974 through 1980. This was music created for space exploration; whether the explorations took place on a spacecraft circling the fifth moon of Zandar, or during some hazy, weed-fueled Midwestern afternoon in a ranch-style home’s basement managed with some Koss headphones and a beanbag chair. Edgar Froese and Tangerine Dream made some heady, dreamscape music that I found myself digging on heavily this past summer. An interesting thing happened with Tangerine Dream. Not very often this happens, but after such an incredible musical output they not only continued to make music in the 80s they flourished. And you see, here’s where, unbeknownst to me at the time, Tangerine Dream made an indelible mark on a young J. Hubner. Risky Business, The Keep, Firestarter, Legend, Three O’Clock High, and Near Dark; these were all movies that colored my formative years heavily. Not only for what was there visually, but what was there playing through the speakers because Tangerine Dream scored every single one of those movies. As a kid I didn’t pay attention to the credits, but I knew there was something unique about the music in those films. They really carried the action and the story for me. Thirty years later I know why, but back then the music just made the film that much better for me. Over the last couple months I’ve since gone back and discovered the amazing soundtracks Tangerine Dream wrote for the films Sorcerer and Thief as well, going so far as to track down Thief on vinyl(as well as Firestarter.) That’s the great thing about a Tangerine Dream score: it’s great in the film or as a standalone LP. How Edgar Froese informed me as a music lover didn’t really come to fruition till the last couple of years. I found myself completely drawn to very synth-heavy artists in 2013 and 2014 and I believe I have Edgar Froese to thank for that. Bands like Sinoia Caves, Jakob Skott, Boards of Canada, Bernard Szjaner, Rudiger Lorenz; as well as film composers like Clint Mansell, Trent Reznor and Atticus Ross, and Cliff Martinez have filled up a good portion of my record collection in the last two years. Every one of those artists owe a huge debt to Mr. Edgar Froese and Tangerine Dream. None of their excellent music would exist the way it does without what Froese created over the last 45 years. I mean, just listen to Cliff Martinez’ excellent Drive score. The film and the score are a homage to what Michael Mann and Tangerine Dream did in both Thief and The Keep. It’s heavy, pulsating, and ominous. It’s both slick and aloof at times. For my ears the Drive S/T is one of the best standalone film soundtracks released in the last thirty years and we have Edgar Froese to thank for that. It seems Edgar Froese, even after Tangerine Dream died down, kept busy and kept creative. He put out albums under his own name as well as continuing the Tangerine Dream “dream”, as it were. The latest conception of the band had his own son in it up until the mid-2000s. One of my favorite synth composers, Ulrich Schnauss, was in the latest incarnation of the band. 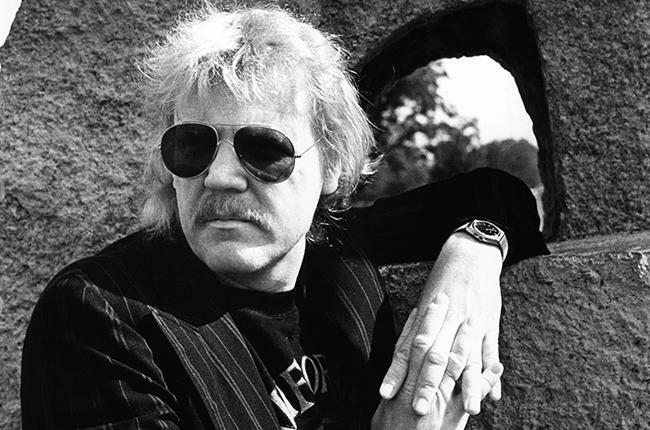 I’d just heard yesterday that Edgar Froese passed away on January 20th, 2015 of a pulmonary embolism. He was 70 years old. It’s very sad news, indeed. We have 45 years worth of music to remember him by. I find that rather comforting. I’ve only started listening to Tangerine Dream a little, but had absolutely no idea about those film scores. Put me right in the mood to watch Near Dark, too – great stuff! Yeah, just some really brilliant film work. I think I might watch Near Dark today as well. Viewed objectively, a half-baked horror flick like The Keep might’ve just been a forgettable 80’s curio. But their soundtrack elevated it to a forever after midnight weird nightmare. Earlier in my life, I looked at my childhood as a lame cultural transition period between the artistically groundbreaking 70’s and the fruition era of the 90’s. But these days I think we were lucky to grow up in the 80’s. There was still room for imagination to do it’s mysterious work. Thank you sir. I agree. Froese was indeed inspirational as well as being a creative genius. I very much look forward to reading your tribute. Thanks for stopping by.